Last May, NBC cancelled its crime drama Crossing Jordan after six seasons on the air. The last episode was originally planned as a cliffhanger, leaving most of the cast stranded atop a frozen mountain after a plane crash. 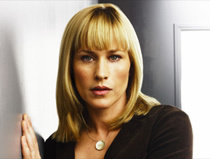 Once the cancellation news came down from the network, the episode’s ending was changed to conclude the storyline. A rescue team arrives after Jordan (Jill Hennessy) finally admits her love for Woody (Jerry O’Connell). Unfortunately, several long-running series questions were left unanswered. Well, one group of devotees is doing something about it. An industrious group of Crossing Jordan fans have gotten together to write a “virtual” seventh season. The plan is to release 31 unauthorized episodes that are authored by an experienced team of fan-fiction writers. One new script will be posted each Sunday night at 10pm (the series’ timeslot for much of its run on NBC) with the season concluding on April 27, 2008. Though the episodes aren’t actually filmed, each script does feature photos, music and even a promo for the next episode. Aside from simply creating new adventures for Jordan and the crew, it’s the writers’ goals to give fans closure and to resolve questions like the identity of Jordan’s mother’s killer and the fate of Jordan and Woody’s new relationship. Unfettered with contracts and actor schedules, the scripts will also feature the return of popular characters like FBI Special Agent Drew Haley, Detective Matt Seely, and Detective Lois Carver (originally played by Chris Noth, David Monahan, and Amy Aquino, respectively). The first two episodes have already been released. “Hold that Thought” focuses on the morgue team uncovering another terror cell and “1000 Miles Off Course” follows a death in an alley investigation and Garret and Lily (Miguel Ferrer and Kathryn Hahn in the series) confront parenting issues. You can check them out by clicking here. Stay tuned! Crossing Jordan: Is the NBC Drama Done? NBC needs to bring Crossing Jordan back! I didn’t have Netflex before so I just finished watching all 117 episodes. It was the best series I have ever seen. I had to play sick to continue watching. I couldn’t stop. This hasn’t happen to me since O.J. Simpson trail. I can’t for the live of me figure out why you quit the series. I just finished seeing all six seasons, three episodes a day, 15 a week. It totally messed up my schedule. Please bring the show back, I could watch 100 seasons. Please bring so closure to this amazing show. Should have gone on for 4 to 5 more seasons. Please give us crossing jordan fans closure. True closure to make us stop thinking about what happens to woody and jordan. Bug and lilly. Nigel and Kate. What happens to garret does he make it back home alive? Do they make it home with enough time to stop the bombing? What truly happens? Crossing jordan is one of my favorite shows on Netflix. The way the show ended wasn’t fair to the fans. Bones even got one more season to give closure…. Netflix please bring Crossing Jordan back. You write your own shows, let this be one. Netflix please bring this show back just to end it out properly!! Is there anyway to read or see Season 7 virtual of “Crossing Jordan”? Obviously every reference is blocked on the internet, and I would LOVE to see what you created. or even the story of how the network shut you down. This link works, only read the first episode so far, but it was fantastic!! I wish Netflix would by and produce the virtual season 7 scripts. I don’t watch very much TV but I was very impressed with her acting skills. I’ve only seen a couple, but boy she pulls it off. Best of luck for the future, she’s a talented woman to be sure.